When you upload a file with latakoo, there are a couple of technical processes that are happening simultaneously, thanks to our patented technology. Typically, these are serial steps, but latakoo combines encoding and compression with transfer to save time. With other encoding and delivery systems, transfer can not begin until encoding is complete. With latakoo, encoding, compression and transfer happen in a single step. Before we get into the technical process, let’s review some terms. Encoding is a general term that describes some way to represent data. Compression is one type of encoding, but there are others, including; encryption, error-correcting and wrapping a file in a different format. Because compression is the most common type of encoding within the video workflow, often times these terms are used interchangeably. However, even in the video workflow that’s not always the case, as we’ll learn in a bit. A codec (short for encoder/decoder) writes and reads data to and from a particular file format. There are specialized codecs for storing video, audio, text — every type of digital data. A container is just another type of file, but a file that contains multiple other files wrapped within it. In the case of audio and video, it’s convenient to have the data for both files wrapped in the same container, so they always travel together. Video and audio codecs are usually independent of container formats. For example, a QuickTime movie can be encoded with the Sony XDCAM codec or the Avid DNxHD codec. Conversely, XDCAM video can be stored in a QuickTime movie or an MXF container file. You can think of a container file as a box. You can put almost anything in the box, including video and audio encoded with any codec. Taking the metaphor a step further, you can think of metadata as the label on the box. It tells you things about the contents of the box. During the upload process, the Flight application encodes the video to H.264 and places it in an MPEG-4 container file. 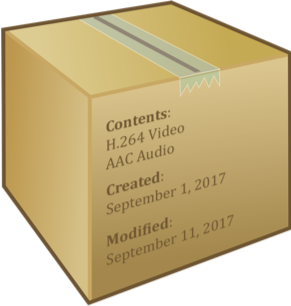 An H.264 creates a smaller, compressed file which gets nicely packaged into an MPEG-4 container for transport to the cloud. When you drop an XDCAM MXF file into Flight, latakoo breaks the file into segments, encodes each segment to H.264, places it in an MPEG-4 container, and sends each segment to the cloud as soon as it’s ready. Since latakoo combines encoding and transfer into a simultaneous process, it is much faster than encoding the complete video clip before transferring it. The original file is broken into smaller pieces. Each piece is encoded to H.264 codec, compressed to a selected bit rate, and uploaded to the latakoo cloud in an .mp4 container. When you download a file, Flight works the same, just in reverse. The file comes down as H.264 MPEG-4 and is encoded to the codec and container format you choose using the Flight application. If you select the default download, it remains the H.264 MPEG-4 that was created for transport to the cloud. The speed of your machine affects the speed of the encoding. If you have a newer machine with a lot of CPU power, the process will be faster. If you need more speed, latakoo HUB automates the transfer and encoding of files quickly and securely, and HUB can also process multiple files at once. During the upload and download process, latakoo Flight will not change any video parameter besides the codec. The raster size, whether it’s high definition or standard definition, whether it’s interlaced or progressive, and the frame rate remain the same. This process, of changing the video parameters is called transcoding. In latakoo configurations, a HUB server handles transcoding as part of a customized workflow. latakoo solutions architects configure HUB to work seamlessly in your workflow. During the upload, as the Flight application is encoding your file, you have the option of deciding how much compression the file will undergo. H.264 encoding will compress the file. The more video is compressed, the smaller the file and the lower the image quality. In the Flight application, you can select the amount of compression applied to the video clip delivered to the cloud (and therefore available for download). You make this selection with the quality slider bar. 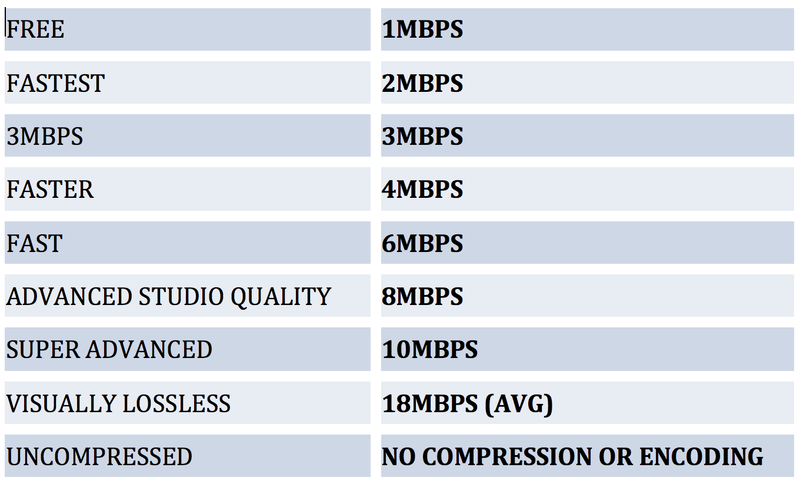 To the far left, the stream-only setting, suitable for web delivery only, is 1mbps, while the visually lossless setting encodes your video sets a maximum bit rate of 18 mbps but attempts to make the file as small as possible while maintaining the same quality as the original to the naked eye. Bitrate is expressed the number of megabits per second (Mbps) used per unit of playback time. Enterprise customers can set the compression rates their Flight users see, eliminating unnecessary options and simplifying the interface for their users. If you choose, you can send the video uncompressed, which delivers the original file to the cloud, without any type of encoding. This is done by choosing the uncompressed setting on the quality slider bar. When this is selected, the latakoo Flight application will deliver your file in the same codec, file type and compression setting as you uploaded. And only that file type is available with a browser download. Sending a video uncompressed is available for any individual uploads. Since group stitching of video files requires encoding to make a single clip from multiple clips, the uncompressed option is not available for stitched files at this time. Want to learn more about latakoo? Join us for a How to latakoo live training each month. Register here to join us.